AFAM Front Sprockets - The best steel alloys for the best front sprockets. Front Sprockets for high-performance motorcycles. AFAM uses the best steel alloys to produce his front sprockets. Minimum tolerances combined with his race tested tooth profile to guarantee the quality required by your powerful motorcycle. AFAM Standard front sprockets (- in the reference) is a replica of your original front sprocket and is used for most motorcycles. AFAM noice damping front sprockets (OEM suffix in the reference) have like some original front sprockets a rubber ring to mute the sound of your transmission, increasing the comfort of the rider. AFAM Racing sprockets are computer designed. Light built but still providing sufficient safety. They are especially designed to save weight in racing applications, usually to fit a smaller and thus lighter chain. In this case they are aligned towards the engine. 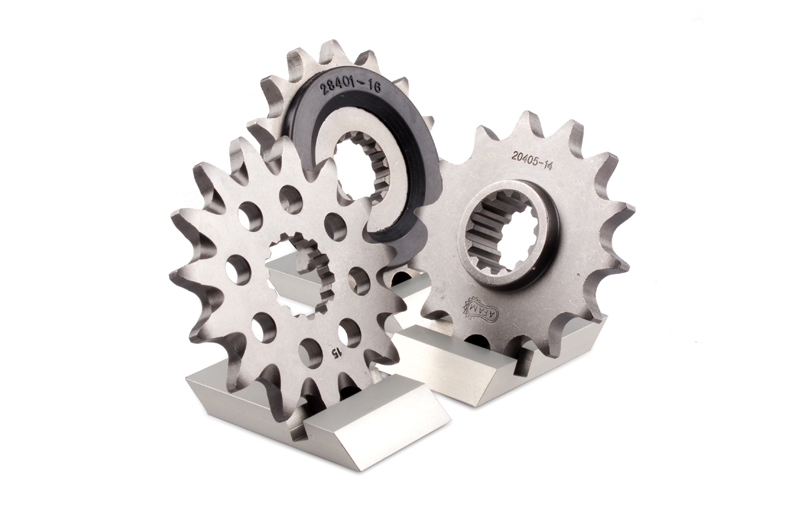 AFAM Self-cleaning front sprockets (+ in the reference) are available for MX and Off-Road use. They have on each side of the tooth bottom, a groove which evacuates sand and mud from the sprocket, this way dirt does not accumulate between sprocket and chain. This accumulated dirt causes over tension to the chain as a result sprocket and chain wear out very quickly, and may even block your bike. With this mud grooved sprocket you avoid these problems.